This week Frank Ocean hit the stage at Panorama Music Festival, Nicki Minaj and Drake linked up at a football game and Kris Jenner stripped off for a selfie. 1. 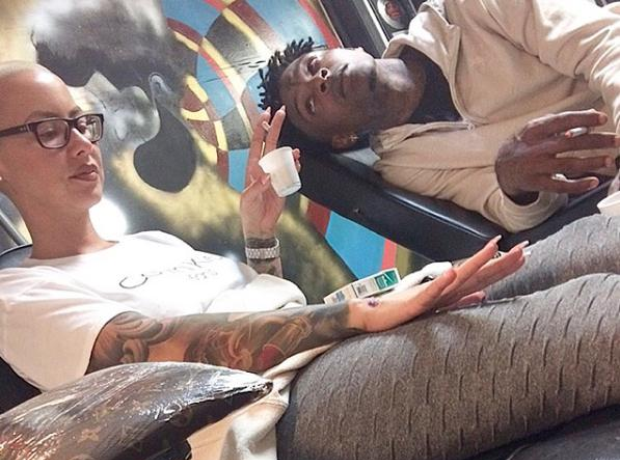 21 Savage stared lovingly at his girlfriend Amber Rose during a trip to the tattoo parlour. 2. Kim Kardashian's puppy selfie was photobombed by her husband, Kanye West. 3. Rita Ora sizzles in her latest bikini snap from her current holiday in Jamaica. 4. This Instagrammer is one seriously big Supreme fan. 5. Drake teased his new OVO store opening in Toronto with a short 'Gyalchester' visual. 6. Chance The Rapper's intern has revealed what it's like to work for the 'Coloring Book' star. 7. J. Cole surprised his fans behind bars by turning up to San Quentin state prison. 8. The rapper posed for pictures with the inmates during his "life changing experience". 9. Cole spoke with people who will never be released from the prison during his emotional visit. 10. Frank Ocean performed at the 2017 Panorama Music Festival in New York. 11. The 'Blonde' singer wore an anti-discrimination T-shirt on stage. 12. A pregnant woman's coworkers threw her a Beyonce-themed baby shower. 13. They gave her a own donut cake, a card and bunches of flowers. 15. Executive producer Asahd Khaled counted his earnings from 'Grateful'. 16. Nicki Minaj cosied up with DJ Khaled's son at an afterparty in Miami. 17. The 'Pinkprint' rapper linked up with Drake at a celebrity football game. 18. Kris Jenner showed off her incredible body in a bedroom selfie. 19. Blac Chyna turned heads in a bright red curly wig.